The pricing of the Ashok Leyland Dost Xpress starts from 5.34 lakh rupees and goes up to 6.50 lakh rupees. The Ashok Leyland Dost Express is a multipurpose utility vehicle for everyone’s needs. It’s a wagon that has all the features that one could ask for. A powerful engine with spacious interiors and a strong axle base, it has got it all. And coming in from Ashok Leyland, it definitely packs a punch for sure. The Ashok Leyland Dost Xpress sports a 1.5L turbocharged diesel common rail engine that has an initial displacement of about 1478cc. The max output of the engine is about 58HP@3300 rpm. Coupled with a 5-speed manual gearbox, it’s got the right amount of power and energy to get all kinds of the job done. The overall weight of the Dost Xpress is about 2650kg. There are multiple configurations to choose from ranging from 9+D all the way up to 12+D. The front axle remains independent and has a leaf spring suspension system on all four wheels. The overall wheelbase spans for about 2600mm. 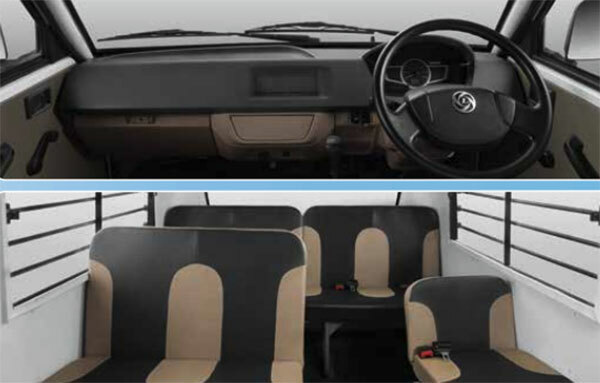 The Ashok Leyland Dost express features a power steering and a mechanical one as well. Also, there is a 4-way adjustable seat configuration available as a stock option. The passenger’s seats are of a bench type format. There are no AC and power windows option available. You get front (disc brakes) and rear (drum brakes). Also as stock, you get seat belts, tubeless tires. But there is no presence of fog lights. The pricing of the Ashok Leyland Dost Xpress starts from 5.34 lakh rupees and goes up to 6.50 lakh rupees. Prices may vary depending on region and availability scenarios. Do check with your closest Ashok Leyland dealer to know more.